These Mason, Ohio homeowners decided it was the right time to replace the aging roof on their home. We installed all new Owens Corning Shingles in the color "Driftwood" on this beautiful home. The homeowners are very happy with the results and the quality of the work! We did a complete new roof with 3D shingles, ice guard, drip edge, flashing & ventilation. Now these homeowners won't have to worry about further roof issues, no mater what weather is thrown at it! Due to a hail storm these homeowners needed to have their roof repaired! We did this Owens Corning Onyx Black roof back in 2015 in Mason, Ohio. As always, we do a complete tear off and install a complete “Roofing System”, which includes all flashings. So about a year or so after installing the roof, the homeowner calls us because there is a leak over their dining room. They also let us know they are having an addition installed & have a general contractor on site that they would like us to meet. He would inspect the roof with us to “double check” our work. I understand their concern because this business is full of dishonesty. We immediately get to the house and do an assessment to locate the area with the other contractor. We pulled a few pieces of Hardie board siding off to look at the flashing behind & everything looked great, even the general contractor was impressed on the extra amount of detail we did in this difficult roof area. After 45 minutes of trying to figure out what the problem could be, we decided to do a water test with the hose since we saw nothing obvious. Sometimes leaks can be very tricky to pinpoint & doing a water test starting low then moving gradually higher, can eliminate different roof areas. After doing a water test we realized the downspout band that was screwed into the trim board was the culprit. Mr & Mrs. R_____ contacted us because they were needing to put on a new roof for their home in Mason, Ohio. We had done a few other houses on the street, so they were familiar with our trucks & yard signs, and also checking our credentials on Angieslist. We met with the homeowners, gave them a detailed bid & answered any questions they had. This was a big job with a challenging design at the garage & house transition that had leaked numerous times before. This area was very tight & difficult to work in. We installed the roof in 2015 & in spring of 2017 the homeowners called & said they had a small leak in that difficult area after a torrential downpour. We immediately went to the home & got on the roof to assess what was going on. The rain was smacking the vinyl siding & window so hard, the water was getting behind the J channel & therefore leaking into the home. Needless to say that we removed the siding & installed house wrap (that was never on the house to begin with) & taped up the windows. Sometimes roofing isn’t a perfect science & wind driven rain can find one small area to get it. This area shouldn’t have anymore issues now. More detail work!! This siding has been leaking off & on for a while. We told the homeowner, when we do this roof & siding, it will not leak again. Severe weather is not uncommon in the state of Ohio, and Mason is no exception. 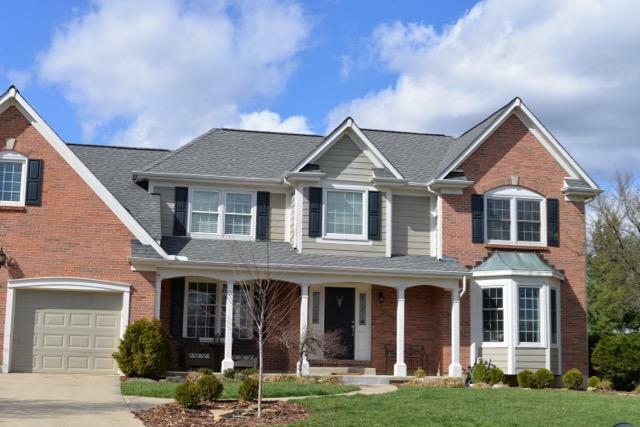 That’s why homeowners in the Mason area need a roof that will stay sturdy and secure through rain, snow, and anything else severe weather might bring. 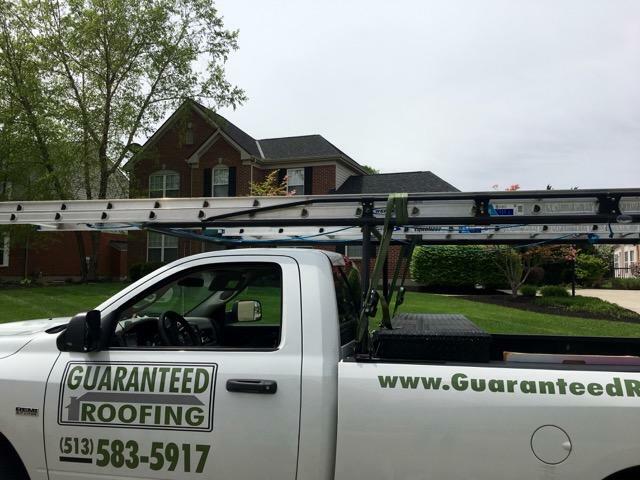 Guaranteed Roofing is a professional roofing company with decades of experience providing roof repair and maintenance as well as complete roof replacement for Mason, Ohio homeowners. 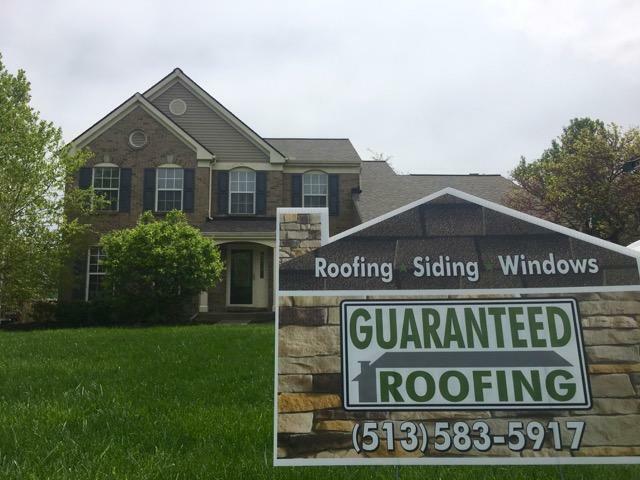 We guarantee skilled craftsmanship and high-quality materials with lifetime warranties, and we are an Owens Corning Preferred roofer with an A+ rating from the Better Business Bureau. When you work with us, we will ensure that your roofing system stays durable and weatherproof in the long-term. Guaranteed Roofing provides roof leak repair, ridge vents and ventilation, hail damage repair, and more for Mason homeowners. Along with our roof repair and maintenance services, we also offer new roof installation as well as replacement roofs for badly damaged or aging roofing systems. Our highly trained roofing experts will complete a comprehensive roof inspection to assess the condition of your current roof, and if necessary we will complete an asphalt shingle roof replacement that will last for years to come. Our asphalt shingle and energy efficient shingle roofing systems are built to stay watertight and keep your home safe and dry through every season. As a CertainTeed ShingleMaster, James Hardie Preferred Contractor, you can trust that we are certified and trained to take care of all of your roof repair and roof installation needs! Along with our roof repair and roof replacement services, Guaranteed Roofing also offers siding repair and new siding installation. If your home has suffered from storm and wind damage, we will repair any damage to your siding and make the process as easy as possible. We also provide steel and vinyl siding replacement. Guaranteed Roofing is your expert roofing contractor, fully prepared to take on any home exterior project such as roof repair, roof installation, siding repair, and more. Contact us today for a free cost estimate in Mason, Ohio or nearby!